The Palestinian Narrative Institute is based at the Treatment and Rehabilitation Center for Victims of Torture (TRC) in Ramallah and provides narrative training and supervision in Arabic. 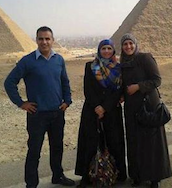 Nihaya Abu Rayyan, Wael Dawabsha and Sahar Mohammad (pictured here in Egypt) are the three senior narrative teachers and supervisors. Dulwich Centre Foundation International works closely with the TRC and the Palestinian Narrative Institute. Click for more information about these collaborations or the TRC.